We still have some striper action here along the Colorado river below the Davis Dam. In the casino area Mike Fisher was able to land a nice 9.38 pound line side at 30 and 1/4 inches. 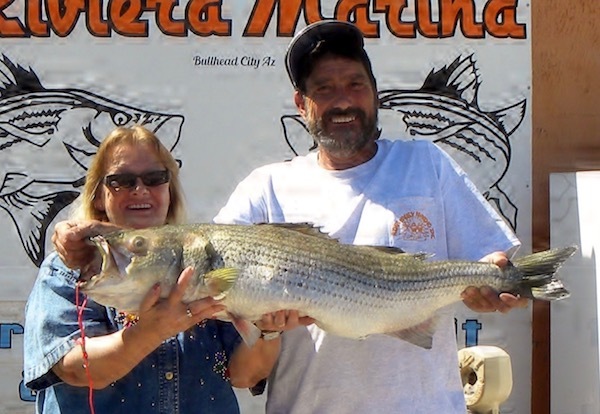 While down river a bit below community park Jay and Tammy Knapp landed a nice trophy of a fish at 17.92 pounds at 36 and 3/4 inches. They were using anchovies from their dock along the river. 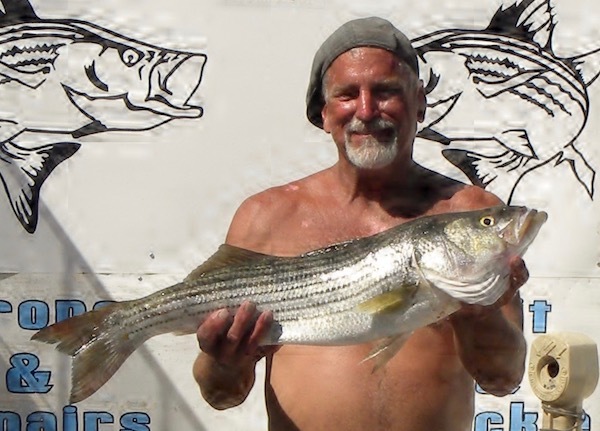 I am hearing of a lot of smaller stripers in the 1 to 3 pound range are being landed in the rotary park area. We now have our first trout stocking of the season from the federal hatchery. The Willow Beach Hatchery is stocking some nice rainbows. Some of these stocked trout are in the 15 inch range. Davis camp and rotary park were the first sites next community park will get a plant of trout along with Davis camp again. You trout anglers might have to mix it up a bit to get these rainbows to the dinner table. Try power bait and night crawlers, I did hear that mice tails were doing ok. A good idea is to throw your favorite spinner for some great action. I like the Panther Martin or the Blue Fox but there are a lot of spinners that will work well the best bet is change your spinner if its not producing. A little word from the marsh spinner baits are working well in a white or green for most Large Mouth Bass and now and again a catfish will go after these colors.